Public Distribution System is functioning according to the National Food Security Act, 2013 and the Tamilnadu Food Security Rules, 2017. The Aim of this rule is to Supply Essential Commodities like Rice, Sugar, Wheat, Kerosene, Dhall and edible oil to the Family Card Holders through Fair Price Shops. Under Public Distribution System the required Essential Commodities are distributed to the Family Card (Smart Card) Holders through Fair Price Shops in a fair manner without any lapses. In this District, the required PDS Essential Commodities to the 1185 Fair Price Shops are allotted directly by the Commissioner of Civil Supplies and Consumer Protection Department, Chennai, through G2G Online and are also uploaded in the Point of Sale (POS) Devices of all Fair price shops. Lead Co-operative Societies are lifting the commodities from the Tamilnadu Civil Supplies Corporation Taluk Godowns and deliver the same to the Fair Price Shops as per the allotment. 4) Taluk Supply Officer, Budalur. 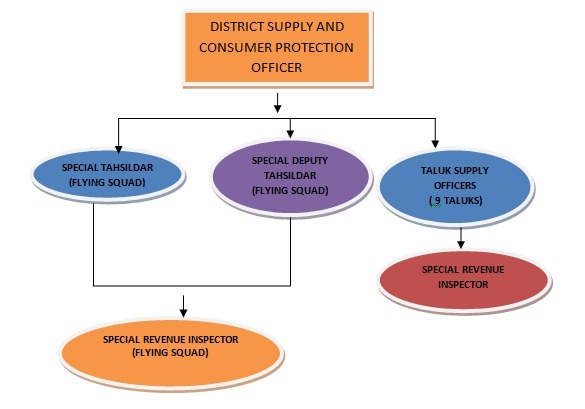 One Special Tahsildar(Flying Squad), one Special Deputy Tahsildar(Flying Squad) and three Special Revenue Inspector(Flying Squad)Posts are created to curtail the smuggling of PDS- Commodities. Application for New Smart Family Card and making Changes in it. The Public can apply for getting new Smart Card, Name inclusion, Name deletion, Change of Address, Change of Shop and District Transfer in the existing Family cards from their residing areas without visiting Taluk Supply Office through a separate website. The web site address is www.tnpds.gov.in The Public should upload the required documents in the web site through e-seva centres and apply. They are inspected and enquired by respective Taluk Supply Officer and the certificates may be received after approval on merits. The new Smart Family Card will be distributed to the applicants through respective Fair price Shops after printing and receipt from Chennai. Public Information Officer – District Supply and Consumer Protection Officer, Thanjaur. Appellate Authority – District Revenue Officer, Thanjavur. Appellate Authority – Respective Sub collector/Revenue Divisional Officer.